of the area surrounding the lake to the height of land. As this long and linear lake stretches south-west into the Coast Range, steep and rugged mountains close in on both ides. This is a true wilderness setting with dramatic views of mountains, glaciers and waterfalls crashing into the lake. Recreational activities in Morice Lake Provincial Park include boating, camping, canoeing, fishing, wildlife viewing, hiking, mountaineering and hunting. Morice Lake provides road accessible camping and boating opportunities in a largely wilderness setting. 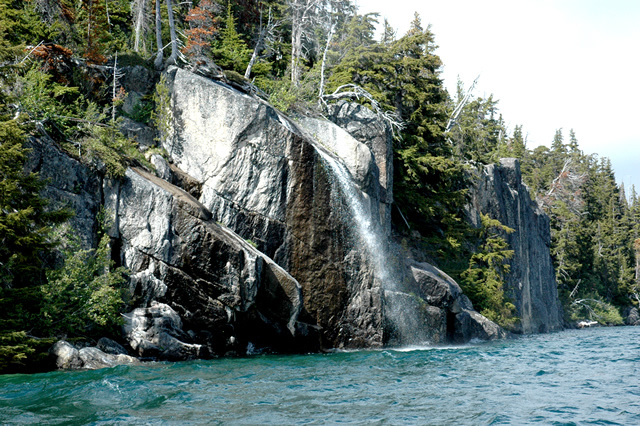 Atna Bay is a popular destination with a waterfall on the Atna River connecting Atna Lake to Morice Lake. There is a series of three portage trails between Morice Lake and Atna Lake for canoe access into Atna River Provincial Park. Strong winds frequently blow out of the Coast Range and down Morice Lake. Waves can get large very quickly. Please keep a close eye on the weather while you are on the lake. The Sanctuary Cabin is a safe location to wait out a wind event. Although Morice Lake is cold and clear, it is suggested to boil water before drinking or use a water purifying system. The mountains in the northwest portion of the park are designated summer nonmotorized. Motorized restrictions apply to land-based activities and do not include aircraft access. Any person acting as a guide or offering guiding services in Morice Lake Park must hold a valid Park Use Permit (Park and Recreation Area Regulation, Section 4). Morice Lake Park is located approximately 84 km from the town of Houston. Access to the park follows a radio controlled logging road; public vehicles are permitted, but please proceed with caution and be aware that loaded logging trucks have the right of way. Travel the Yellowhead Highway (Hwy 16) to the town of Houston. Turn south 2 kilometres west of Houston onto the Morice River Forest Service Road (also known as the Huckleberry Mine road). This Forest Service Road (FSR) is marked in kilometres starting at the Canfor Mill site near the Yellowhead Highway. Driving 27 kilometres will bring you to the junction of the Huckleberry and Morice Lake Roads. Turn right onto the Morice Lake Road and continue to kilometre marker 75. Take a right at the intersection just past the 75 km mark. Follow this road for 7 km to arrive at Morice Lake Park. Blue directional blades are posted at intersections along the route to the Park. History: The name Morice Lake was adopted in the 9th Report of the Geographic Board of Canada in 1910 in association with the Morice River which drains the lake. The lake was named after the Rev. Father Adrien-Gabriel Morice, author of “The History of the Northern Interior of British Columbia,” which describes his 20 years of explorations and missionary work in this area of the province. The traditional Wet’suwet’en name is Wet-zuhn-buhn (pronounced wet-zin-bun), meaning the “blueish-green colour of the water.” Morice River is called Wet-zuhn-kwa. In the Wet’suwet’en language “Kwa” refers to a river or stream, and “buhn” refers to a body of water like a lake. The park is one of seven new parks and protected areas resulting from the Morice Land and Resource Management Plan (LRMP) and associated government-to-government discussions with the Office of the Wet’suwet’en. Legislation of the park occurred in July, 2008. Culture: Morice Lake Provincial Park is located within the traditional territory of the Wet’suwet’en First Nation. Known as the people of the lower drainage, the Wet’suwet’en have been living in this part of the continent since time immemorial. The park lies in the Lhudis Bin and C’iniggit Nenikëkh house territories within the Wet’suwet’en territory. The Lhudis Bin house territory is in the house of Cas yex (Grizzly House) that belongs to the Gitdumden (Bear/Wolf) clan. The C’iniggit Nenikëkh house territory is in the house of Yextsowiten (Thin House) that belongs to the Gilseyhyu (Big Frog) clan. Water quality, fish habitat and fish populations at the headwaters of an important salmon and steelhead river. Wildlife (Grizzly bears, mountain goats, moose, deer, caribou). Habitat for wildlife within the park and the adjacent land-base of the Morice River watershed. The lake provides important rearing habitat for the Nanika River sockeye stock and has resident populations of rainbow and lake trout, Dolly Varden, burbot and kokanee. The upper reaches of the Morice River provides important spawning habitat for Chinook salmon. Forests in the park reflect a transition from interior types in the east, to coastal types in the west. The park also contains good quality Grizzly Bear habitat, riparian and wetland ecosystems, rare whitebark pine ecosystems, and blue-listed Bull Trout. The high fisheries values in Morice Lake Park are integral to the Wet’suwet’en people, indicated by the many archaeological sites occurring along the lake. Morice Lake Provincial Park also provides important ecosystem services (the benefits that people receive from ecosystems) that include clean water, natural flood control, carbon storage, air purification, nutrient cycling, food, biodiversity, recreation, aesthetic experience and spiritual experience. Morice Lake plays an important role in regulating water quantity, water temperature, and release of spring melt waters, which is important for both fish habitat and downstream water users. Wildlife: This is a wilderness Park and many species of wildlife are prevalent and widespread. Larger species include: grizzly bears, black bears, mountain goats, moose, deer, and caribou. Please do not approach animals, allow plenty of space during viewing opportunites. Smaller species you may encounter include: hoary marmots, wolverines, and Siberian lemmings as well as various bird species, including willow ptarmigans, gray-crowned rosy finches and golden-crowned sparrows. Members of the grouse family occur in considerable numbers and waterfowl are usually plentiful in the lakes. The management plan for Morice Lake Provincial Park was approved in September 2010. View the management plan [PDF 2.65MB]. Morice Lake is a beautiful setting for a canoe trip. Winds and waves can come up quickly. Paddle early to avoid the wind and stay close to shore once it starts to blow. Fishing is a popular activity on the lake. Angling restrictions are in place on the Morice River to protect spawning salmon and other species. There is no fishing near the outlet of Morice Lake to Gosnell Creek from January 1 to September 30 and no fishing for salmon at any time. The Morice River is a Class II water from September 1 to October 31 and a steelhead stamp is mandatory during that time. Bait is not permitted and angling from boats is not permitted from August 15 to December 31. Please read the BC Fishing Regulations. A series of three short portage trails connects Atna Bay of Morice Lake (Morice Lake Provincial Park) with Atna Lake (Atna River Provincial Park). No other developed trails exist within the park. Google Earth KMZ file of the Atna Portage Trails, must have Google Earth and/or and Google Maps installed. Hunting is allowed in the park. All hunters to the area should refer to the current BC Hunting Regulation synopsis. Morice Lake is very cold, but those with a hardy constitution may be interested in a swim. Please do not use soap (even biodegradable) for washing in the lakes. If you must wash with soap, do it at least 50 m (150 ft) inland from the lakeshore. There are no lifeguards on duty at provincial parks. There are great viewing opportunities in Morice Lake Provincial Park. A gravel boat launch is situated at the North end of the Morice Lake campsite. The boat launch is not steep. In fall when the water is low, it is often difficult to get boat trailers into deep enough water to launch. Waterskiing and windsurfing are not popular activities on Morice Lake due to its very cold temperature. The Sanctuary Cabin (see Park map) is available for public use on a first-come, first-served basis. It is equipped with a woodstove and can accomodate 4 - 6 people. Visitors must supply their own sleeping and cooking equipment. Google Earth KMZ file of the location of the Sanctuary Cabin, must have Google Earth and/or and Google Maps installed. Although there is no formalized day-use area, park visitors can utilize vacant lakeshore campsites for day visits. Morice Lake Park has an 18 unit campsite. Each of the campsites has a picnic table and fire ring. Pit toilets are available. The sites are suitable for tenting, pickup trucks with campers and small trailers. The campground is accessible during snow free months. As this site is user maintained, please pack out what you pack in.